What is special about the LS-52EN? The LS-52EN comes with an electronic lock and a digital thumb throw latch. Along with tamper proofing that limits the potential of burglar break-in. After 4 incorrect entries are made in a row, the person who is trying to get in is immediately locked out. It has everything needed to prevent unauthorized access to any valuables you store inside. The lock is battery powered and has an indicator light that will prompt you when the batteries are running low. In any case of the lock unexpectedly running out of battery juice, the unit does come with back up keys just in case of battery failure. The electronic lock is simple to program and can be changed easily if your access code is ever compromised. There is no need for any kind of prior computer expertise or knowledge. The manual has it all covered. The spacious interior measures 20.28 inches high by 13.39 wide by 3.35 inches deep. The unit provides enough room to store things such as important documents, valuable jewelry, medication, or handguns and ammunition. The two removable shelves provide options for customization and organization. Although not the biggest safe, the LS-52EN has more than enough space for most people. You can certainly fit quite a bit of stuff with proper organization within in the safe. We at TossTheKey were able to fit quite a few items when testing. Fortunately, the large flange prevents the need for re-plastering the wall around the installation site. It can easily be a single person job and it fits securely in between 16 inch on center studs. any possible attacks. This is the perfect hidden wall safe with an inset door and knob that allow it to sit flush against the wall. It can be completely covered by mirrors, pictures and furniture which will add an extra layer of security in concealment. Measuring 20.67 inches in height 13.78 inches in width and 3.74 inches in depth and weighing in at 35 lbs. The LS-52EN it is incredibly easy to install using the included hardware and instruction guide. Please do ensure that you properly install that safe to maximize security against any potential risk. This high quality safe will give you the peace of mind you need when it comes to storing your most valuable possessions. Sturdy, easy to operate with plenty of room it is the perfect addition to your home. 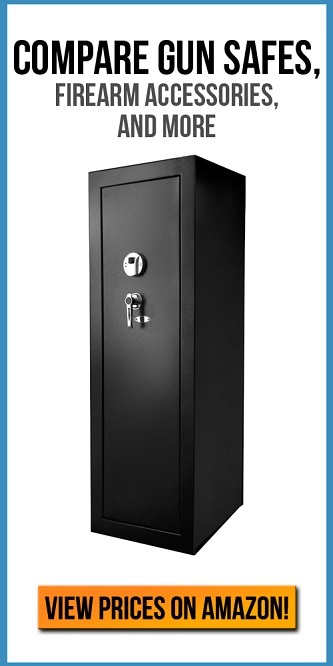 The LockState LS-52EN is a great wall safe for any home.